A decoratively carved Swedish Gustavian 'Svenska' model chair in a wonderful pale blue antique patina with gorgeous checked upholstery. 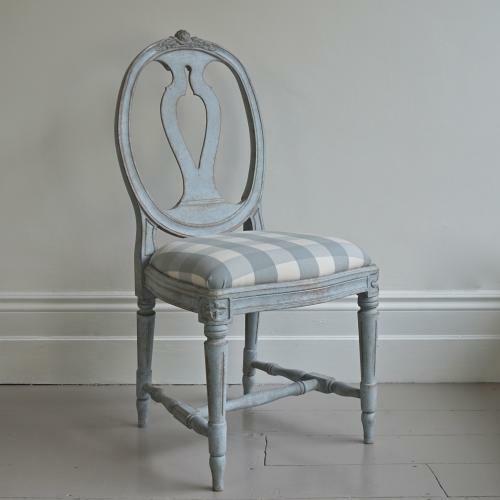 This chair is part of the 'Bespoke Collection' at Georgia Lacey Antiques and is an historically accurate, hand carved rendition of the original 1780's Swedish Gustavian side chair. Each bespoke piece is artisan made near Stockholm using traditional wood working skills handed down over the centuries, before being hand painted in Sweden and finished in a beautiful antique patina. We have a wide range of authentic Swedish colours to choose from. Available individually, or may be ordered in larger sets in a fabric of your choice. N.B. These chairs are all hand made to order, so please allow a lead time of 6 to 8 weeks for sets of 8 chairs or more.